"Volga" redirects here. For other uses, see Volga (disambiguation). Not to be confused with Volta River. The Volga (/ˈvɒlɡə, ˈvoʊlɡə/; Russian: Во́лга, IPA: [ˈvoɫɡə] ( listen); Tatar: İdel, Ätil, İtil; Chuvash: Atăl, Kazakh: Edil) is the longest river in Europe with a catchment area of 1,350,000 square kilometres. It is also Europe's largest river in terms of discharge and drainage basin. The river flows through central Russia and into the Caspian Sea, and is widely regarded as the national river of Russia. Cruise ships on the Volga. The Russian hydronym Volga (Волга) derives from Proto-Slavic *vòlga "wetness, moisture", which is preserved in many Slavic languages, including Ukrainian volóha (воло́га) "moisture", Russian vlaga (влага) "moisture", Bulgarian vlaga (влага) "moisture", Czech vláha "dampness", Serbian vlaga (влага ) "moisture", Croatian vlaga "moisture" and Slovene vlaga "moisture" among others. The Slavic name is a loan translation of earlier Scythian Rā (Ῥᾶ) "Volga", literally "wetness", cognate with Avestan Raŋhā "mythical stream" (also compare the derivation Sogdian r’k "vein, blood vessel" (*raha-ka), Persian رگ rag "vein") and Vedic Sanskrit rasā́ (रसा) "dew, liquid, juice; mythical river". The Scythian name survives in modern Mordvin Rav (Рав) "Volga". The Turkic peoples living along the river formerly referred to it as Itil or Atil "big river". 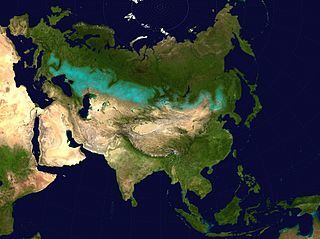 In modern Turkic languages, the Volga is known as İdel (Идел) in Tatar, Атăл (Atăl) in Chuvash, Idhel in Bashkir, Edil in Kazakh, and İdil in Turkish. The Turkic peoples associated the Itil's origin with the Kama. Thus, a left tributary to the Kama was named the Aq Itil "White Itil" which unites with the Kara Itil "Black Itil" at the modern city of Ufa. The name Indyl (Indɨl) is used in Adyge (Cherkess) language. Among Asians,[clarification needed] the river was known by its other Turkic name Sarı-su "yellow water", but the Oirats also used their own name, Ijil mörön or "adaptation river". Presently the Mari, another Uralic group, call the river Jul (Юл), meaning "way" in Tatar. Formerly, they called the river Volgydo, a borrowing from Old East Slavic. The Volga is the longest river in Europe, and its catchment area is almost entirely inside Russia, though the longest river in Russia is the Ob–Irtysh river system. It belongs to the closed basin of the Caspian Sea, being the longest river to flow into a closed basin. Rising in the Valdai Hills 225 meters (738 ft) above sea level northwest of Moscow and about 320 kilometers (200 mi) southeast of Saint Petersburg, the Volga heads east past Lake Sterzh, Tver, Dubna, Rybinsk, Yaroslavl, Nizhny Novgorod, and Kazan. From there it turns south, flows past Ulyanovsk, Tolyatti, Samara, Saratov and Volgograd, and discharges into the Caspian Sea below Astrakhan at 28 meters (92 ft) below sea level. At its most strategic point, it bends toward the Don ("the big bend"). Volgograd, formerly Stalingrad, is located there. The Volga has many tributaries, most importantly the rivers Kama, the Oka, the Vetluga, and the Sura. The Volga and its tributaries form the Volga river system, which flows through an area of about 1,350,000 square kilometres (521,238 square miles) in the most heavily populated part of Russia. The Volga Delta has a length of about 160 kilometres (99 miles) and includes as many as 500 channels and smaller rivers. The largest estuary in Europe, it is the only place in Russia where pelicans, flamingos, and lotuses may be found. The Volga freezes for most of its length for three months each year. The Volga drains most of Western Russia. Its many large reservoirs provide irrigation and hydroelectric power. The Moscow Canal, the Volga–Don Canal, and the Volga–Baltic Waterway form navigable waterways connecting Moscow to the White Sea, the Baltic Sea, the Caspian Sea, the Sea of Azov and the Black Sea. High levels of chemical pollution have adversely affected the river and its habitats. The fertile river valley provides large quantities of wheat, and also has many mineral riches. A substantial petroleum industry centers on the Volga valley. Other resources include natural gas, salt, and potash. The Volga Delta and the nearby Caspian Sea offer superb fishing grounds. Astrakhan, at the delta, is the center of the caviar industry. The area downstream of the Volga, widely believed to have been a cradle of the Proto-Indo-European civilization, was settled by Slavs, Huns and other Turkic peoples in the first millennium AD, replacing the Scythians. The ancient scholar Ptolemy of Alexandria mentions the lower Volga in his Geography (Book 5, Chapter 8, 2nd Map of Asia). He calls it the Rha, which was the Scythian name for the river. Ptolemy believed the Don and the Volga shared the same upper branch, which flowed from the Hyperborean Mountains. The Russian ethnicity in Western Russia and around the Volga river evolved also, among other tribes, out of the East Slavic tribe of the Buzhans. Several localities in Russia are connected to the Buzhans, like for example Sredniy Buzhan in  the Orenburg Oblast, Buzan and the Buzan river in the Astrakhan Oblast. Buzhan (Persian: بوژان‎, also Romanized as Būzhān; also known as Būzān) is also a village in Nishapur, Iran. Subsequently, the river basin played an important role in the movements of peoples from Asia to Europe. A powerful polity of Volga Bulgaria once flourished where the Kama joins the Volga, while Khazaria controlled the lower stretches of the river. Such Volga cities as Atil, Saqsin, or Sarai were among the largest in the medieval world. The river served as an important trade route connecting Scandinavia, Rus', and Volga Bulgaria with Khazaria and Persia. Khazars were replaced by Kipchaks, Kimeks and Mongols, who founded the Golden Horde in the lower reaches of the Volga. Later their empire divided into the Khanate of Kazan and Khanate of Astrakhan, both of which were conquered by the Russians in the course of the 16th century Russo-Kazan Wars. The Russian people's deep feeling for the Volga echoes in national culture and literature, starting from the 12th-century Lay of Igor's Campaign. The Volga Boatman's Song is one of many songs devoted to the national river of Russia. Construction of Soviet Union-era dams often involved enforced resettlement of huge numbers of people, as well as destruction of their historical heritage. 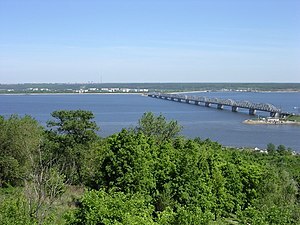 For instance, the town of Mologa was flooded for the purpose of constructing the Rybinsk Reservoir (then the largest artificial lake in the world). The construction of the Uglich Reservoir caused the flooding of several monasteries with buildings dating from the 15th and 16th centuries. In such cases the ecological and cultural damage often outbalanced any economic advantage. During the Russian Civil War, both sides fielded warships on the Volga. In 1918, the Red Volga Flotilla participated in driving the Whites eastward, from the Middle Volga at Kazan to the Kama and eventually to Ufa on the Belaya. In modern times, the city on the big bend of the Volga, currently known as Volgograd, witnessed the Battle of Stalingrad, possibly the bloodiest battle in human history, in which the Soviet Union and the German forces were deadlocked in a stalemate battle for access to the river. The Volga was (and still is) a vital transport route between central Russia and the Caspian Sea, which provides access to the oil fields of the Apsheron Peninsula. Hitler planned to use access to the oil fields of Azerbaijan to fuel future German conquests. Apart from that, whoever held both sides of the river could move forces across the river, to defeat the enemy's fortifications beyond the river. By taking the river, Hitler's Germany would have been able to move supplies, guns, and men into the northern part of Russia. At the same time, Germany could permanently deny this transport route by the Soviet Union, hampering its access to oil and to supplies via the Persian Corridor. For this reason, many amphibious military assaults were brought about in an attempt to remove the other side from the banks of the river. In these battles, the Soviet Union was the main offensive side, while the German troops used a more defensive stance, though much of the fighting was close quarters combat, with no clear offensive or defensive side. Many different ethnicities lived on the Volga river. Numerous were the Eastern Slavic Vyatchi tribes which took a decisive role in the development of modern Russians. Among the first recorded people along the upper Volga were also the Finno-Ugric people Mari (Мари) and their west ethnic group named Merya (Мäрӹ). The Volga river was also inhabited by the Iranian people of the Sarmatians from 200 BC. In the 8th and 9th centuries colonization also began from Kievan Rus'. Slavs from Kievan Rus' brought Christianity to the upper Volga, and a portion of non-Slavic local people adopted Christianity and gradually became East Slavs. The remainder of the Mari people migrated to the east far inland. In the course of several centuries the Slavs assimilated the indigenous Finnic populations, such as the Merya and Meshchera peoples. The surviving peoples of Volga Finnic ethnicity include the Maris and Mordvins of the middle Volga. Also Khazar and Bulgar peoples inhabited the upper, middle and lower of the Volga River basin. Apart from the Huns, the earliest Turkic tribes arrived in the 7th century and assimilated some Finnic and Indo-European population on the middle and lower Volga. The Christian Chuvash and Muslim Tatars are descendants of the population of medieval Volga Bulgaria. Another Turkic group, the Nogais, formerly inhabited the lower Volga steppes. The Volga region is home to a German minority group, the Volga Germans. Catherine the Great had issued a Manifesto in 1763 inviting all foreigners to come and populate the region, offering them numerous incentives to do so. This was partly to develop the region but also to provide a buffer zone between the Russians and the Mongols to the East. Because of conditions in German territories, Germans responded in the largest numbers. Under the Soviet Union a slice of the region was turned into the Volga German Autonomous Soviet Socialist Republic. Others were executed or dispersed throughout the Soviet Union prior to and after World War II. In some locations, the Volga has a rocky west bank. The Volga, widened for navigation purposes with construction of huge dams during the years of Joseph Stalin's industrialization, is of great importance to inland shipping and transport in Russia: all the dams in the river have been equipped with large (double) ship locks, so that vessels of considerable dimensions can travel from the Caspian Sea almost to the upstream end of the river. 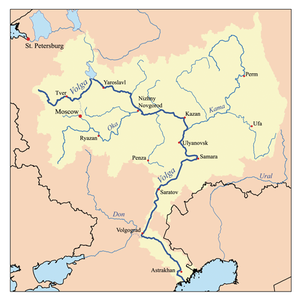 Connections with the river Don and the Black Sea are possible through the Volga–Don Canal. Connections with the lakes of the North (Lake Ladoga, Lake Onega), Saint Petersburg and the Baltic Sea are possible through the Volga–Baltic Waterway; and commerce with Moscow has been realised by the Moscow Canal connecting the Volga and the Moskva River. This infrastructure has been designed for vessels of a relatively large scale (lock dimensions of 290 by 30 metres (951 ft × 98 ft) on the Volga, slightly smaller on some of the other rivers and canals) and it spans many thousands of kilometers. A number of formerly state-run, now mostly privatized, companies operate passenger and cargo vessels on the river; Volgotanker, with over 200 petroleum tankers, is one of them. In the later Soviet era, up to the modern times, grain and oil have been among the largest cargo exports transported on the Volga. Until recently access to the Russian waterways was granted to foreign vessels on a very limited scale. The increasing contacts between the European Union and Russia have led to new policies with regard to the access to the Russian inland waterways. It is expected that vessels of other nations will be allowed on Russian rivers soon. View of the river and Volgograd from space. ^ a b c d e f g Scheffel, Richard L.; Wernet, Susan J., eds. (1980). Natural Wonders of the World. United States of America: Reader's Digest Association, Inc. p. 406. ISBN 0-89577-087-3. ^ See Max Vasmer's dictionary under "Волга". ^ J.P. Mallory & D.Q. Adams, Encyclopedia of Indo-European Culture, s.v. "dew" (London: Fitzroy Dearborn, 1997), 158-9. ^ Michiel de Vaan, Etymological Dictionary of Latin and the Other Italian Languages, s.v. "rōs, rōris" (Leiden: Brill, 2008), 526-7. ^ Nourai, Ali. 2013. An Etymological Dictionary of Persian, English and Other Indo-European Languages. Index of Words in Different Languages Vol. 1 Vol. 1. p.130. ^ "Early East Slavic Tribes in Russia". Study.com. Retrieved 2018-12-16. ^ "Weather Sredniy Buzhan | Forecast, Radar, Lightning & Satellite". Meteologix - bookmark this page. Retrieved 2018-12-16. ^ "The Volga" (Microsoft FrontPage 12.0). www.volgawriter.com. Retrieved 2010-06-11. ^ "In all, Soviet dams flooded 2,600 villages and 165 cities, almost 78,000 sq. km. – the area of Maryland, Delaware, Massachusetts, and New Jersey combined – including nearly 31,000 sq. km. of agricultural land and 31,000 sq. km. of forestland". Quoted from: Paul R. Josephson. Industrialized Nature: Brute Force Technology and the Transformation of the Natural World. Island Press, 2002. ISBN 1-55963-777-3. Page 31. ^ Brian Pearce, Introduction to Fyodor Raskolnikov s "Tales of Sub-lieutenant Ilyin." ^ "::The Battle of Stalingrad::". Historylearningsite.co.uk. Retrieved 2010-06-11. ^ "Early East Slavic Tribes in Russia | Study.com". Study.com. Retrieved 2018-10-13. ^ Mikhail., Zhirohov, (2019). The Khazars : a Judeo-Turkish Empire on the Steppes, 7th-11th Centuries AD. Nicolle, David., Hook, Christa. London: Bloomsbury Publishing Plc. p. 47. ISBN 9781472830104. OCLC 1076253515. ^ Bašić, Marko (2015-05-14). "Noble Sarmatian Grave Discovered In Russia". Slavorum. Retrieved 2019-03-28. ^ Tim., McNeese, (2005). The Volga river. Philadelphia: Chelsea House Publishers. p. 14. ISBN 0791082474. OCLC 56535045. ^ "Unique History of Volga River That You Need to Know - Learn Russian Language". Learn Russian Language. 2018-06-30. Retrieved 2018-10-13. ^ Korotenko, K. A.; Mamedov, R. M.; Mooers, C. N. K. (2000). "Prediction of the Dispersal of Oil Transport in the Caspian Sea Resulting from a Continuous Release". Spill Science & Technology Bulletin. 6 (5–6): 323. doi:10.1016/S1353-2561(01)00050-0. ^ "NoorderSoft Waterways Database". Noordersoft.com. Archived from the original on November 9, 2005. Retrieved 2010-06-11. Wikimedia Commons has media related to Volga. Wikisource has the text of the 1911 Encyclopædia Britannica article Volga. Lenin Volga–Don Shipping Canal is a canal which connects the Volga River and the Don River at their closest points. Opened in 1952, the length of the waterway is 101 km (63 mi), 45 km (28 mi) through rivers and reservoirs. Nogay Horde, Nohai Horde or Nogay Yortu was a confederation of about eighteen Turkic and Mongol tribes that occupied the Pontic-Caspian steppe from about 1500 until they were pushed west by the Kalmyks and south by the Russians in the 17th century. The Mongol tribe called the Manghits constituted a core of the Nogay Horde. Tsimlyansk Reservoir or Tsimlyanskoye Reservoir is an artificial lake on the Don River in the territories of Rostov and Volgograd Oblasts at 47°50′N 42°50′E. Completed in 1952, the reservoir is one of the largest in Russia, providing power and irrigation to the Rostov and Volgograd regions. Crops grown around the lake include wheat, rice, cotton, maize, alfalfa, fruit, grapes, and vegetables. The Volga Upland, also known as the Volga Uplands, Volga Plateau, Volga Hills, or Volga Plateau, is a vast region of East European Plain in European part of Russia that lies west of the Volga River and east of the Central Russian Upland. The uplands run for approximately 500 miles (804 km) in a southwest-northeasterly direction from Volgograd to Kazan. The Tsimlyansk Reservoir lies at the southwestern end of the Volga Upland, with the Kuybyshev Reservoir at the northeastern end. Kuybyshev Reservoir or Kuybyshevskoye Reservoir, sometimes called Samara Reservoir and informally called Kuybyshev Sea, is a reservoir of the middle Volga and lower Kama in the Chuvash Republic, Mari El Republic, Republic of Tatarstan, Samara Oblast and Ulyanovsk Oblast, Russia. The Kuybyshev Reservoir has a surface area of 6,450 km² and a volume of 58 billion cubic meters. It is the largest reservoir in Europe and third in the world by surface area. The major cities of Kazan, Ulyanovsk, and Tolyatti are adjacent to the reservoir. The Volga Hydroelectric Station or Volga GES also known as the 22nd Congress of the CPSU Stalingrad/Volgograd Hydroelectric Power Station, is the largest hydroelectric station in Europe, and it is the last of the Volga-Kama Cascade of dams, immediately before the Volga River flows into the Caspian Sea. It was the largest powerstation in the world between 1960 and 1963. Today, it is operated by the electricity company RusHydro. The Caspian Sea is the world's largest inland body of water, variously classed as the world's largest lake or a full-fledged sea. It is an endorheic basin located between Europe and Asia, to the east of the Caucasus Mountains and to the west of the broad steppe of Central Asia. The sea has a surface area of 371,000 km2 and a volume of 78,200 km3. It has a salinity of approximately 1.2%, about a third of the salinity of most seawater. It is bounded by Kazakhstan to the northeast, Russia to the northwest, Azerbaijan to the west, Iran to the south, and Turkmenistan to the southeast. 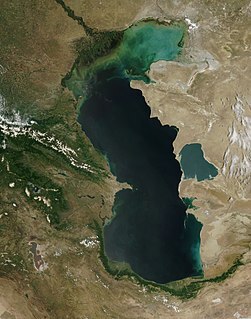 The Caspian Sea is home to a wide range of species and may be best known for its caviar and oil industries. Pollution from the oil industry and dams on rivers draining into the Caspian Sea have had negative effects on the organisms living in the sea. The Volgograd Reservoir is a reservoir in Russia formed at the Volga River by the dam of the Volga Hydroelectric Station. It lies within the Volgograd Oblast and Saratov Oblast and named after the city of Volgograd. It was constructed during 1958-1961. The Privolzhskaya Railway is a subsidiary of the Russian Railways headquartered in Saratov. It serves the Saratov, Volgograd, and Astrakhan regions of Russia. Its three branches are headquartered in Saratov, Volgograd, and Astrakhan. The railway route length totals 4236,8 km. The network has 31 146 employees. A short stretch of the railway crosses the territory of Kazakhstan. It was established in 1953 by the merger of the Stalingrad Railway and Ryazan-Uralsk Railway and was recently extended to Olya, a port on the Caspian Sea. The Black Sea-Caspian Steppe is an informal name for that part of the Eurasian Steppe that extends south between the Black and Caspian Seas. It is usually treated as part of the Pontic-Caspian steppe which includes the area north of the Black and Caspian Seas, but there is some reason to treat it as a distinct place. Its natural boundaries are the Sea of Azov and Black Sea on the west, the Caucasus Mountains on the south and the Caspian Sea on the east. Its northern boundary may be taken as the triangle formed by the lower Don River and Volga River which are about 60 km apart to the west of Volgograd. This article excludes the north slope of the Caucasus which is not steppe and has a distinct geography and history. Volga-Kama Nature Reserve is a Russian 'zapovednik' at the confluence of the Volga River, the Kama River, and the Myosha River. There are two sections to the reserve, one on the left bank terraces of the Volga, at the actual meeting point of the rivers, the other section about 100 km up the Volga on the western outskirts of the city of Kazan. The reserve is situated in the Zelenodolsky Districts and Laishevsky District of Tatarstan. It was formally established in 1960 to protect remaining forest and forest-steppe habitat of the middle Volga region, and has an area of 8,024 ha (30.98 sq mi). A particular focus of scientific study is the effects of the Kuybyshev Reservoir on the local environment. The reservoir was completed in the mid-1950s, and is the largest reservoir in Europe. The Volga-Kama Reserve is part of a UNESCO Biosphere Reserve.